The Committee of 100 was a British anti-war group. It was set up in 1960 with a hundred public signatories by Bertrand Russell, Ralph Schoenman, Michael Scott, and others. Its supporters used mass nonviolent resistance and civil disobedience to achieve their aims. 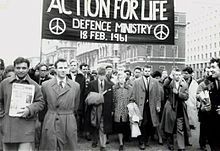 The idea of a mass civil disobedience campaign against nuclear weapons emerged early in 1960 in discussions between Ralph Schoenman (an activist in the Campaign for Nuclear Disarmament (CND)), and Hugh Brock, April Carter (both of the Direct Action Committee against nuclear war), Ralph Miliband, Alan Lovell and Stuart Hall. Schoenman approached Bertrand Russell, the president of CND, with the idea. Russell resigned from the presidency of CND in order to form the Committee of 100, which was launched at a meeting in London on 22 October 1960 with a hundred signatures. Russell was elected as president and Michael Randle of the Direct Action Committee was appointed secretary. The Campaign for Nuclear Disarmament has done and is doing valuable and very successful work to make known the facts, but the press is becoming used to its doings and beginning to doubt their news value. It has therefore seemed to some of us necessary to supplement its campaign by such actions as the press is sure to report. There is another, and perhaps more important reason for the practice of civil disobedience in this time of utmost peril. There is a very widespread feeling that however bad their policies may be, there is nothing that private people can do about it. This is a complete mistake. If all those who disapprove of government policy were to join massive demonstrations of civil disobedience they could render government folly impossible and compel the so-called statesmen to acquiesce in measures that would make human survival possible. Such a vast movement, inspired by outraged public opinion is possible, perhaps it is imminent. If you join it you will be doing something important to preserve your family, compatriots and the world. Many in the Campaign for Nuclear Disarmament, including some of its founders, supported the Committee of 100's campaign of civil disobedience and in its first year it received more in donations than CND had received in its first year. Several of the early CND's activists, including some members of its executive committee, had been supporters of the Direct Action Committee and in 1958 CND had cautiously accepted direct action as a possible method of campaigning; but, largely under the influence of Canon John Collins, the CND chairman, the CND leadership opposed any sort of unlawful protest, and the Committee of 100 was created as a separate organisation partly for that reason and partly because of personal animosity between Collins and Russell. It has been suggested that this separation weakened the campaign against nuclear weapons. The Committee's campaign tactic was to organise sit-down demonstrations, which were not to be undertaken without at least 2,000 volunteers pledging to take part. Many eminent people participated in the sit-downs but few of the 100 signatories took part in the Committee's activities. Demonstrators were required to adopt a discipline of non-violence. In a briefing document the Committee of 100 said, "We ask you not to shout slogans and to avoid provocation of any sort. The demonstrations must be carried out in a quiet, orderly way. Although we want massive support for these demonstrations, we ask you to come only if you are willing to accept this non-violent discipline." Demonstrators were recommended to remain limp if arrested and to refuse to co-operate in any way until inside the police station. At first, the Committee of 100 differed from CND only in its methods, and they had the same objectives. Within the Committee, however, there were different ideas about civil disobedience, direct action and non-violence. Bertrand Russell saw mass civil disobedience merely as a way of getting publicity for the unilateralist cause. Those from the Direct Action Committee were absolute pacifists (some of them Christians) who followed Gandhi, and they regarded direct action as a way of creating a non-violent society. Ralph Schoenman and others, including the anarchists who later led the organisation, saw direct action as a sort of insurrection that could force the state to give up nuclear weapons. These factions argued among themselves about whether non-violence was a matter of principle or just a tactic and whether the Committee should limit itself to demonstrations or adopt a more thoroughgoing anarchist programme. Nicolas Walter, a prominent member of the Committee, said later that it had been an anarchist organisation from its inception and that the hundred signatories were, in effect, a front. The Committee's first act of civil disobedience on 18 February 1961 was a sit-down demonstration at the Ministry of Defence in Whitehall, London, to coincide with the expected arrival of USS Proteus on the River Clyde. (Picture) Between 1,000 and 6,000 people took part. Somewhat to the surprise of the Committee, there were no arrests. At the next sit-down demonstration, on 29 April in Parliament Square, the police arrested 826 people. There were also marches and sit-downs against nuclear testing and demonstrations at the US and Soviet embassies in London and at the Polaris submarine base. On 17 September, Battle of Britain Day, supporters blocked the pierheads at Holy Loch and the approaches to Trafalgar Square. (Picture) The September demonstration is regarded as the high-water mark of the Committee of 100. A week before the demonstration, the hundred committee members were summoned to court without charge under the Justices of the Peace Act of 1361 because they "incited members of the public to commit breaches of the peace" and were likely to continue to do so. The court bound them to a promise of good behaviour for twelve months; thirty-two, including Bertrand Russell, then aged 89, refused and chose to go to prison instead. It is estimated that 12,000 to 15,000 attended the demonstration despite the invocation of the Public Order Act, which effectively made it illegal to be in the vicinity of central London that day. Several thousand sat down and there were 1,314 arrests, but no violence from demonstrators despite allegations of police brutality. The success of the September demonstration encouraged the Committee to move from symbolic sit-down demonstrations in London to mass direct action at the places where nuclear weapons would be deployed, and they planned simultaneous demonstrations on 9 December to walk on to air force bases at Wethersfield, Ruislip, Brize Norton, Cardiff to sit on the runways and to prevent planes from taking off, and street sit-downs in Bristol, Manchester and York. By this time the authorities had begun to take the Committee of 100 more seriously. The official response had escalated from prosecution for incitement to breach of the peace to prosecution for the much more serious offences of conspiracy and incitement to breach the Official Secrets Act. Six organisers, the "Wethersfield Six", were charged with these offences and five later imprisoned for eighteen months: Ian Dixon, Terry Chandler, Trevor Hatton, Michael Randle, Pat Pottle; and the sixth, Helen Allegranza, to twelve months. (Picture) Bertrand Russell said that he was equally responsible, but the authorities ignored him and concentrated on the six young, unknown Committee of 100 officers. 3,000 military and civilian police were mobilised at Wethersfield. 5,000 demonstrated there and 850 were arrested. The Wethersfield demonstration was regarded by many as a failure and it was the Committee's last act of large-scale civil disobedience. There were recriminations within the Committee, one internal memorandum saying that its policies had turned it into "a public spectacle, a group isolated from the general body of public opinion and feeling." Herbert Read resigned from the Committee, saying that the action was "strategically foolish". The Committee was weakened by the imprisonment of its officers. The force used by the police at sit-down demonstrations surprised many of the demonstrators, which, with the Committee's insistence on nonviolence and the use of pre-emptive arrests for conspiracy, discouraged many, and support dwindled. The Committee's plan to "fill the jails" by means of mass civil disobedience, and thus compel the government to respond to their demands, was frustrated by the authorities imprisoning a few important members and ignoring the rest. The harsh sentences on the Wethersfield Six "brought home to the Committee its inadequacy when faced with the might of the State," and some of the Committee's leaders were not willing to "fill the jails", mounting strenuous appeals against conviction or, in the case of Pat Pottle, going on the run. By 1962, half of the original 100 signatories had resigned and had been replaced. The Committee was in debt and had to face the failure of its mass civil-disobedience campaign. It was dissolved and the campaign was decentralized, thirteen regional committees, each with a hundred members, becoming responsible for organizing demonstrations, with a co-ordinating National Committee. Of the regional committees, the London Committee of 100 was the most active and influential. A national magazine was launched by the London Committee in April 1963, published under the name Resistance from January 1964. Like CND, the Committee of 100 had begun with a self-appointed and unelected leadership, and, like CND, it faced pressure for greater participation by supporters. This re-organisation was intended to involve more people in decision making and to spread demonstrations throughout the country and had been anticipated in the creation of a number of subgroups in December 1961. Although Bertrand Russell opposed it, he wrote that "The Committee has found that its support, named and on file, is so extensive that regional committees are required to accommodate this strength," But supporters became exhausted by the number of demonstrations they attended and "neither London nor the regional committees had their full complement of a hundred." In March 1962 Russell addressed a sit-down demonstration in Parliament Square against the sentences on the Wethersfield Six. All the 1,172 protesters were arrested, but there was a growing feeling that such demonstrations were becoming an end in themselves and would not now create a mass movement against nuclear weapons. (Contemporary research showed that public support for the unilateralist cause actually declined in the period when the Committee of 100 was most active.) A sit-down of 7,000 outside the Air Ministry planned for the following September had to be called off because of lack of support, a "public assembly" being held instead. To underline its opposition to Russian nuclear weapons as well as those of the West, the Committee held a demonstration in Red Square, Moscow, at an international congress of the World Peace Council in the summer of 1962 calling for the abolition of all nuclear weapons and attacking the Soviet system. From 1962 onwards, the Committee became increasingly radical and extended its campaigns to issues other than nuclear weapons. Peter Cadogan, an officer of the Committee, said it was "trying to go in 12 directions at once", including campaigning for civil liberties in Greece, against Harold Wilson's failure to produce a promised Vietnam peace initiative and against siting London's third airport at Stansted. Diana Shelley, a member of the London Committee of 100, said that as the Committee adopted objectives other than nuclear disarmament it became "less non-violent". In 1963 Russell resigned, though he remained in sympathy with the early aims and activities of the Committee and was careful not to denigrate it publicly. Following his departure, the public image of the Committee deteriorated, many signatories also resigned and "the Committee of 100 ventured even further into the wilderness of libertarian politics". Members of the Committee were responsible for the Spies for Peace revelations in 1963 about the Regional Seats of Government, a network of secret government bunkers, and later for the escape of George Blake from Wormwood Scrubs Prison. The Committee's interest in Greek politics was sparked by the banning of a march by the Greek "Bertrand Russell Committee of 100" in Easter 1963, by the expulsion of some of the British Committee of 100's members when they attempted to join the march, and by the murder of Grigoris Lambrakis, a Greek MP and peace activist. Plans to protest against the London visit by King Paul and Queen Frederika in July 1963 were met by official attempts to prevent the demonstrations and draconian prison sentences on demonstrators. The government was criticized in the press for the severity of its treatment of the demonstrators and eventually there were embarrassing climb-downs. Some of the sentences were overturned on appeal and the Home Secretary, Henry Brooke, had to offer financial compensation. One of the demonstrators, Donald Rooum, proved that an offensive weapon had been planted on him and forced a public inquiry that criticized the police and led to the eventual imprisonment of three officers. But a nine-months sentence on Terry Chandler, secretary of the London Committee, was upheld on appeal. Diana Shelley said that the imprisonment of Chandler, "the force which had driven" the Committee throughout the summer, had a profoundly damaging effect. Four years after these events, following the 1967 military coup in Greece, a "non-violent invasion" of the Greek embassy resulted in prison sentences of up to fifteen months for Committee of 100 demonstrators. According to Christopher Driver, the name was suggested by Gustav Metzger and Ralph Schoenman, who derived it from the Guelph Council of 100. Before the Committee of 100 came on the scene, civil disobedience on this scale was virtually unknown in Britain, although the researches of its advocates uncovered it as a strand of protest throughout the centuries. The Committee of 100, and comparable movements outside the UK (not least the Civil Rights Movement in the United States), made it a common method of social action, now familiar in environmental, animal rights and peace protests. However, the Committee's strict insistence on nonviolence is rare. The Committee also popularized a new method of organization derived from anarchism and hitherto unfamiliar to those in traditional political parties: without formal membership and based on decentralization and autonomous, self-selected "working groups" rather than elected executive committees. Many of the original signatories were later replaced. The list did not include its president, Bertrand Russell, the original officers, Helen Allegranza, Terry Chandler, Ian Dixon, Trevor Hatton, Pat Pottle and Michael Randle, or the later officers, Brian McGee, Jon Tinker, Peter Moule, William Hetherington or Peter Cadogan. ^ a b c d Carroll, S.J., Fill the Jails: Identity, Structure and Method in the Committee of 100, 1960 – 1968, University of Sussex, 2010. ^ a b c d e f g h i j k l m n o p q r s Driver, Christopher, The Disarmers: A Study in Protest, London: Hodder and Stoughton, 1964. ^ Russell, B., "Civil Disobedience", New Statesman, 17 February 1961. ^ a b c d e f g h i j k l m Taylor, R., Against the Bomb, Oxford University Press, 1988. ^ a b Mass Resistance - Wethersfield - Ruislip, Committee of 100, 1961. ^ a b c d e f g h i j k l m Shelley, Diana, "Influx or exodus? Anarchists and the Committee of 100", Anarchy, No. 50, April 1965. ^ Walter, Nicolas, Damned Fools in Utopia, PM Press, 2011. ^ a b c d e From Protest to Resistance, a Peace News pamphlet, Mushroom Books, Nottingham, 1981, p.18 ISBN 0-907123-02-3. ^ http://www.legislation.gov.uk/aep/Edw3/34/1 Justices of the Peace Act, 1361. ^ a b Chandler (Terence Norman) v DPP (No 1). ^ a b c d Peers, Dave, "The impasse of CND", International Socialism, International Socialism, No. 12, Spring 1963, pp. 6–11. ^ Myers, F.E., "Civil Disobedience and Organizational Change: The British Committee of 100", Political Science Quarterly, Vol. 86, No. 1. (March 1971), pp. 92-112. ^ Russell, B. Yours Faithfully, Bertrand Russell, Open Court, Chicago and La Salle, 2001, p. 282. ^ London Committee of 100, Beyond Counting Arses, 1963. Cited in Gopodway, David Anarchist Seeds Beneath the Snow, Liverpool University Press, 2006. ^ Snyder, W.P., The Politics of British Defense Policy, 1945-1962, Ohio University Press, 1964, p. 61. ^ Christopher Driver, The Disarmers, London: Hodder and Stoughton, 1964. ^ The Guardian, 12 July 1962. ^ Obituary of Peter Cadogan. ^ Camley, N., Cold War Secret Bunkers, Pen & Sword Books, 2007. ^ Pottle, P., and Randle M., The Blake Escape, Sphere Books, 1990. ^ a b Ewing, K. D., "Cold war, civil liberties and the House of Lords", in Campbell, Tom, K.D. Ewing and Adam Tomkins (eds), The Legal Protection of Human Rights, Oxford: Oxford University Press, 2011. ^ Cadogan, Peter, "Non-violence as a reading of history", Anarchy, No. 20, October 1962, London, Freedom Press. Pathe news film of 1963 demonstrations against the Greek royal visit. Pathe news film of 1963 demonstration at Porton Down, Wiltshire. This page was last edited on 12 April 2019, at 15:49 (UTC).